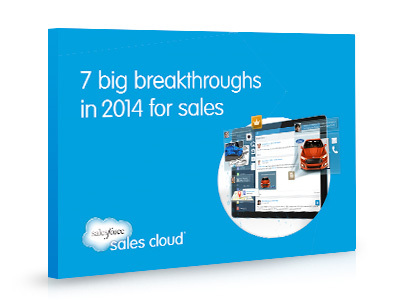 Free e-book: 7 sales breakthroughs for 2014. To grow revenue, you need more than a simple Customer Relationship Management (CRM) application — you need Salesforce. Managing contacts is just the beginning. You can also track all sales activity — every lead, opportunity, and customer — and take action from wherever you are. With the world’s #1 CRM, you spend more time selling to the right people, armed with their personal marketing data and social insights. Download “7 sales breakthroughs for 2014” now and shatter your sales records in 2014.